Symbolism was a late nineteenth century art movement of French and Belgian origin in poetry and other arts. French Symbolism was in large part a reaction against Naturalism and Realism, movements which attempted to capture reality in its particularity. These movements invited a reaction in favor of spirituality, the imagination, and dreams; the path to Symbolism begins with that reaction. Some writers, such as Joris-Karl Huysmans, began as naturalists before moving in the direction of Symbolism; for Huysmans, this change reflected his awakening interest in religion and spirituality. The Symbolist movement in literature has its roots in Les Fleurs du mal (The Flowers of Evil) by Charles Baudelaire. The aesthetic was developed by Stephane Mallarmé and Paul Verlaine during the 1860s and 1870s. During the 1880s, the aesthetic was articulated through a series of manifestos, attracting a generation of writers. The works of Edgar Allan Poe, which Baudelaire greatly admired and translated into French, were a significant influence and the source of many stock tropes and images. Distinct from the Symbolist movement in literature, Symbolism in art represents an outgrowth of the more gothic and darker sides of Romanticism; but while Romanticism was impetuous and rebellious, Symbolist art was static and hieratic. —both poets seek to identify one sense experience with another, although it seems that neither of them actually experienced synesthesia. Verlaine argued that in their individual and very different ways, each of these hitherto neglected poets found genius a curse; it isolated them from their contemporaries, and as a result these poets were not at all concerned to avoid hermeticism and idiosyncratic writing styles. In this conception of genius and the role of the poet, Verlaine referred obliquely to the aesthetics of Arthur Schopenhauer, the philosopher of pessimism, who held that the purpose of art was to provide a temporary refuge from the world of blind strife of the will. A number of important literary publications were founded by Symbolists or became associated with the movement; the first was La Vogue, founded in April 1886. In October of that same year, Jean Moréas, Gustave Kahn, and Paul Adam began Le Symboliste. One of the most important Symbolist journals was Le Mercure de France, edited by Alfred Vallette, which succeeded La Pléiade; founded in 1890, this periodical lasted until 1965. Pierre Louÿs founded La conque, a periodical whose Symbolist leanings were alluded to by Jorge Luis Borges in his story Pierre Menard, Author of the Quixote. Other Symbolist literary magazines included La Revue blanche, La Revue wagnérienne, La Plume and La Wallonie. Rémy de Gourmont and Félix Fénéon were literary critics associated with the Symbolist movement. Drama by Symbolist authors formed an important part of the repertoire of the Théâtre de l'Œuvre and the Théâtre des Arts. The Symbolist and Decadent literary movements were satirized in a book of poetry called Les Déliquescences d'Adoré Floupette, published in 1885 by Henri Beauclair and Gabriel Vicaire. Symbolism in literature is distinct from Symbolism in art although the two overlapped on a number of points. In painting, Symbolism was a continuation of some mystical tendencies in the Romantic tradition, which included such artists as Caspar David Friedrich, Fernand Khnopff, and John Henry Fuseli and it was even more closely aligned with the self-consciously dark and private movement of Decadence. There were several, rather dissimilar, groups of Symbolist painters and visual artists, among whom Gustave Moreau, Odilon Redon, Pierre Puvis de Chavannes, Henri Fantin-Latour, Edvard Munch, Félicien Rops, and Jan Toorop were numbered. 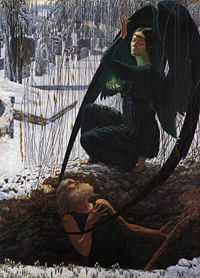 Symbolism in painting had an even larger geographical reach than Symbolism in poetry, reaching several Russian artists, as well as figures such as Elihu Vedder in the United States. Auguste Rodin is sometimes considered a Symbolist in sculpture. The Symbolist painters mined mythology and dream imagery for a visual language of the soul, seeking evocative paintings that brought to mind a static world of silence. The symbols used in Symbolism are not the familiar emblems of mainstream iconography but intensely personal, private, obscure and ambiguous references. More a philosophy than an actual style of art, the Symbolist painters influenced the contemporary Art Nouveau movement and Les Nabis. In their exploration of dreamlike subjects they are also precursors of the Surrealists; Bernard Delvaille has described René Magritte's surrealism as "Symbolism plus Freud." The Symbolist aesthetic had a deep impact on the works of Claude Debussy. His choices of libretti, texts, and themes come almost exclusively from the Symbolist canon: in particular, compositions such as his settings of Cinq poèmes de Baudelaire, various art songs on poems by Paul Verlaine, the opera Pelléas et Mélisande with a libretto by Maurice Maeterlinck, and his unfinished sketches that illustrate two Poe stories, The Devil in the Belfry and The Fall of the House of Usher, all indicate that Debussy was profoundly influenced by Symbolist themes and tastes. His best known work, the Prélude à l'après-midi d'un faune, was inspired by a poem by Stephen Mallarmé. Symbolism's cult of the static and hieratic adapted less well to narrative fiction than it did to poetry. Joris-Karl Huysmans' 1884 novel À rebours (English title: Against the Grain) contained many themes which became associated with the Symbolist aesthetic. This novel in which very little happens is a catalogue of the tastes and inner life of Des Esseintes, an eccentric, reclusive antihero. The novel was imitated by Oscar Wilde in several passages of The Picture of Dorian Gray. The same emphasis on an internal life of dreams and fantasies have made Symbolist theater difficult to reconcile with more recent tastes and trends. Auguste Villiers de l'Isle-Adam's drama Axel (rev. ed. 1890) is a definitive Symbolist play; in it, two Rosicrucian aristocrats fall in love while trying to kill each other, only to agree to mutually commit suicide because nothing in life could equal their fantasies. From this play, Edmund Wilson took the title Axel's Castle for his influential study of the Symbolist aftermath in literature. Maurice Maeterlinck was another Symbolist playwright; his theatrical output includes both Pelléas and Melisande, and L'Oiseau Bleu ("The Blue Bird"), another theatrical fantasy. The later works of the Russian playwright Anton Chekhov have been identified as being deeply influenced by Symbolist pessimism. Under Symbolist influence, the Russian actor and director Vsevolod Meyerhold developed a balletic theory of acting in contrast to Konstantin Stanislavski's system, which focused on learning gestures and movements as a way of expressing outward emotion. Meyerhold's method was influential in early motion pictures, and especially on the works of Sergei Eisenstein. 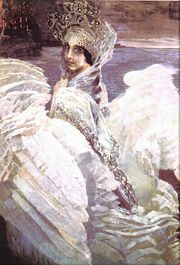 The Swan Princess (1900) by Russian symbolist painter Mikhail Vrubel (1856-1910). ↑ Les fenêtres. Retrieved November 9, 2015. Symbolism – Gustave Moreau, Puvis de Chavannes, Odilon Redon. This page was last modified on 10 November 2015, at 00:21.